Kia Motors is previewing a range of new technologies developed for the post-autonomous driving era at the Consumer Electronics Show (CES) 2019, to be held in Las Vegas from January 8 to 11. Building on the the brand’s ‘Beyond Autonomous Driving’ vision for connected vehicles presented at CES 2018, Kia is looking ahead to a time when autonomous driving has become the norm with an interactive ‘Space of Emotive Driving’ exhibit at this year’s show. In a future where vehicles have the potential to drive themselves, Kia is laying the foundations for major technological development to improve the human mobility experience. Central to the presentation of this ‘Space of Emotive Driving’ vision at CES 2019 is Kia’s new Real-time Emotion Adaptive Driving (R.E.A.D.) System – a world-first emotional AI-based optimized and interactive in-cabin space centered on human senses. The R.E.A.D. System can optimize and personalize a vehicle cabin space by analyzing a driver’s emotional state in real-time through AI-based bio-signal recognition technology. The technology monitors a driver’s emotional state using sensors to read their facial expressions, heart rate and electrodermal activity. It then tailors the interior environment according to its assessment – potentially altering conditions relating to the five senses within the cabin, creating a more joyful mobility experience. AI deep-learning technology enables the system to establish a baseline in user behavior, and then identify patterns and trends to customize the cabin accordingly. The R.E.A.D. System is revealed alongside V-Touch – a world-first virtual touch-type gesture control technology. V-Touch employs a 3D camera to monitor users’ eyes and fingertip, allowing occupants to manage several in-car features via an unobtrusive head-up display. Through simple finger gestures, all vehicle occupants can make changes to the cabin environment, including lighting, HVAC (heating, ventilation and air-conditioning) and entertainment systems, eliminating the need for buttons or touch screen. Another feature of the innovative R.E.A.D. System is Kia’s music-response vibration seats, where occupants can ‘feel’ their favorite songs as well as listen to them. The sensory-based signal processing technology adapts seat vibrations according to sound frequencies of the music being played. The vibration seats can also be set to massage mode to increase cabin comfort, as well as enhancing safety by providing haptic warnings from the vehicle’s advanced driver-assist systems. Some of the technical expertise required to make this demo possible arose out of Kia’s research collaboration with the Massachusetts Institute of Technology (MIT) Media Lab’s Affective Computing Group as part of Kia’s Media Lab membership. 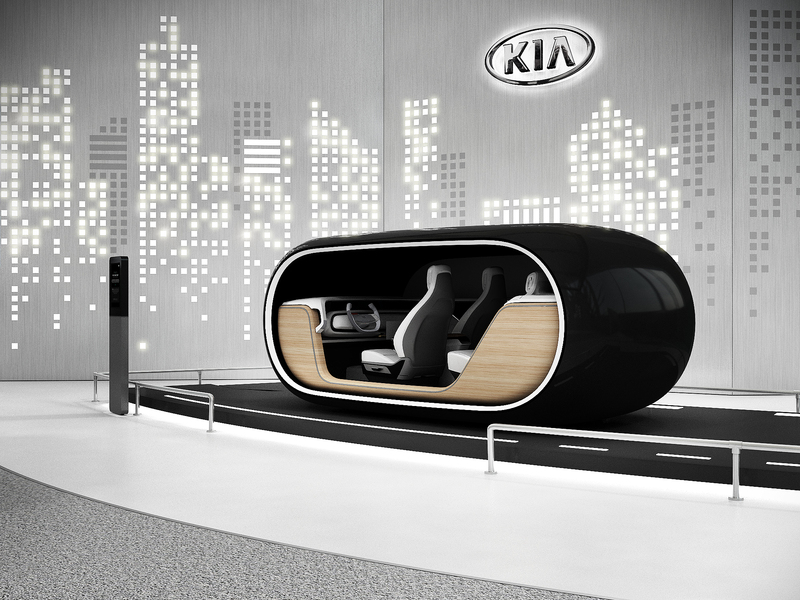 Kia will have specially-designed experiential modules installed at its CES booth to demonstrate the potential of the R.E.A.D. System. For the first time ever, the public will be able to experience vehicle technology that recognizes their physiological emotions based on facial expressions, electrodermal activity, and heart rate. Visitors to CES will be able to witness the sensory controls react in real-time to their changing emotional state. ‘R.E.A.D. Me’ is a one-person cockpit that analyzes the ‘driver’s’ emotional state and creates a ‘space mood’ according to its judgment, using R.E.A.D. technologies such as facial expression recognition and vibration seats. This tailored environment will include bespoke sounds and fragrances to best suit the occupant’s current disposition. ‘R.E.A.D. Now’ is a two-person cockpit simulating a ‘Las Vegas autonomous tour car’ that will make suggestions on route choice and in-car entertainment based on an analysis of the driver’s mood. The occupants will be invited to use the V-Touch gesture control system to play games, select music genres, modify the cabin environment and browse the internet for local information. ‘R.E.A.D. Motion’ is a four-person cockpit which simulates a ‘mobile workspace’ that is expected to be a key benefit of life with autonomous vehicles. Occupants will be invited to take on the role of a ‘Kia executive’ preparing for a business trip, using V-Touch to check their schedule and meeting minutes, open emails and so on. The long-distance functionality of the system means occupants can take control of the R.E.A.D. Motion cockpit controls from a distance. The experience will finish with a live conference call on the head-up display. Kia is also presenting a potential solution for smart-city mobility at CES 2019 with its ‘SEED Car’ concept. The ‘SEED Car’ is a four-wheel electric cycle with a range of 100 km (62 miles) based on a pedal-electric hybrid system, requiring pedal input from the driver but with a high degree of electric power assistance to make it effortless. The concept has been designed to make urban driving easy, fun and safe, while exploring how Kia could make the final mile of any journey possible with a personal mobility device. For longer journeys, the ‘SEED Car’ is housed within the ‘BIRD Car’ – an autonomous shuttle vehicle capable of travelling further than the four-wheel cycle’s range capabilities. Once within 100km of its final urban destination, the ‘SEED Car’ is ‘dispersed’ to complete its journey. For an enhanced visitor experience, Kia will operate 15-minute ‘Docent Tours’ at regular intervals at the booth throughout the duration of CES 2019. The guided tour will give attendees a more in-depth understanding of the new technologies on display. For more information, please visit www.kia.com/worldwide/CES2019. Visit Kia Motors at CES 2019 on Tuesday, January 8 through Friday, January 11 at the Las Vegas Convention Center (LVCC), North Hall Booth #7029. * Hyundai Motor Group is a global corporation that has created a value chain based on automobiles, steel, and construction and includes logistics, finance, IT and service. With about 250,000 employees worldwide, the group’s automobile brands include Hyundai Motor Co. and Kia Motors Corp.